Many Uni Watch readers do not like the NBA’s sleeved jerseys. They think it’s not what a basketball uniform should look like, it’s not what God intended, and so on. I wanted to hear a different point of view, so I recently invited readers who do like the sleeves to tell me why they like them. I also asked them how it feels to be out of step with so many of their fellow readers. I like the sleeved jerseys. I like that the front chest logo is big and bold, and might get lost on a tank top with all the side piping and striping. It does look better on some teams than others, though. The darker road jerseys look great; the white, so-so. I don’t hate them. I think for one team, an argument could be made that it could become a franchise staple, like the St. Louis Cardinals’ chain stitched logos or the “GSH” on the Chicago Bears’ sleeves. A better example might be when the Colorado Rockies and Cincinnati Reds were the only teams with vest jerseys — a quirk, an anomaly that makes you appreciate the formula for the rest of the league. I like the idea of sleeved NBA jerseys, and I’m baffled by the negative reaction they sometimes get. It’s just a normal shirt; I cannot see a single thing wrong with wearing a regular-cut shirt for any sport. The designs vary, of course. The worst ones are the ones that place a large logo in the center of the shirt: the Bulls, the Thunder, the Knicks, the Spurs. But a design like the Warriors’ yellow sleeved jersey, with the unique collar piping and the wordmark and number in front over a sublimated logo, is beautiful. Furthermore, I’d call the Nets’ black-and-white ABA-style sleeved jersey their only good look. It’s cool has the jersey has a matching set of shorts. I’m a 17-year-old high schooler who grew up in the Oregon Ducks era, meaning I’m used to seeing a new and different uniforms all the time. As for sleeved basketball jerseys I like them because it gives the team a chance to do something different, and a lot of the time it looks nice. But I don’t like it when a team goes “sleeves for sleeves’ sake.” If it looks like their normal Jersey but with sleeves tacked on, I’m not a fan. 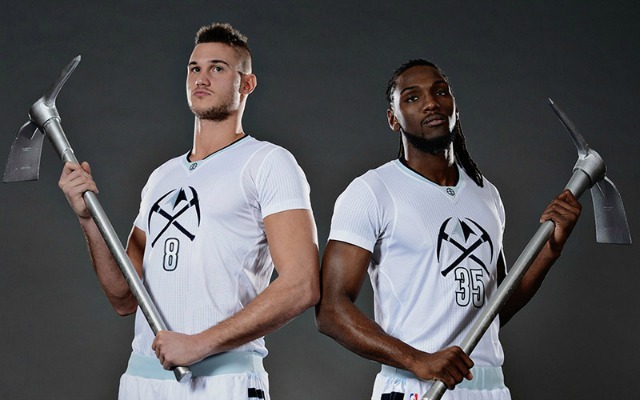 The Nuggets did great with the whiteout and the big logo — it’s flashy and different and I like it. The idea was there. Create something the fan could wear seven days a week without pulling a tank top from the closet. I just think the execution was flawed. When they first introduced sleeved jerseys, I enjoyed them simply because I would rather wear one than a traditional jersey. Since then I’ve enjoyed seeing how different teams utilize them. Utah’s most recent example of an almost soccer-like jersey adds interesting design possibilities. Personally, I think sleeves are great, as they allow for more creative designs than the traditional NBA jerseys. When they’re done right, I think they can be some of the better-looking jerseys in the league. The fact that they don’t look like a basketball jersey is inconsequential — the team logos do a fine job of communicating the sport and they look fine in action. Much better than the sleeved compression shirt under a sleeveless jersey look that some players are going with (e.g., Anthony Davis), in my opinion. As for liking something so many others hate, outside of the Uni Watch-isphere, plenty of people that I talk to have no problem with the look. So among non-uni-obsessives (which is my normal crowd), it’s not a big deal. Among non-uni-obsessive NBA fans, I get a little more flack for saying, “Oh, that jersey looks nice,” but I try not to argue about opinions with people, so I simply state what I like about a particular jersey, listen to the argument against it (usually something about tradition, but rarely anything about the actual aesthetics unless it’s a particularly ugly jersey), and move on. Online, where I frequent sites like Uni Watch and others, I feel like my opinion is more of a minority opinion, but again, I try not to expend energy arguing opinions, so I’ll usually just take arguments against the sleeves in stride. I actually prefer the sleeved look in the NBA. I’m a hockey player, so sleeved jerseys are nothing new to me (although if hard-pressed, I think soccer kits are the most aesthetically pleasing, not just from a fashion standpoint, but also for displaying the athletic physique). The sleeved jersey allows more room for logos, numbers, names, and other stylish details than the traditional tank top jerseys. You can fit a large logo or a phrase specific to a city (Detroit’s “Motor City,” Charlotte’s “Buzz City”, etc.) while allowing more room for white/black/team color space. When you start adding these elements to a traditional jersey, it results in a jumbled mess and certainly looks too busy. Additionally, the athletic build of NBA athletes is changing. The sleeved jersey tends to “hide” less than perfect physiques (i.e., less muscular arms, narrow shoulders) while enhancing the look of players who have toned biceps and triceps. Also, with the addition of corporate logos on the horizon, a sleeve should be the natural choice for its location. I should start by saying that I have not loved all the designs that have been incorporated into the sleeved jersey program. In particular, I really didn’t like the oversized logo designs; some teams pulled if off because of the symmetry of their logos (Bulls), but others looked awkward (Cavs) due to the unbalanced nature of the logo. • Sleeves make the uniforms bigger, which in turn makes the players look more uniform ”” specially in sport played by so many players with differing skin tones. I’m trying to deconstruct that aesthetic opinion for sniffs of racism, but I don’t think that’s what’s at work here. I always find that the white guy on the floor looks out of place (although easy to spot). I’m sure that’s because so much skin is visible in basketball. The more I think about this, the more I worry that this preference for homogeny might be latently racist, but I can’t quite pin down how. • The NBA is such a “me” league in a “me” sport. When boatloads of money are being spent curating the athlete’s signature look ”” shoes, sweatbands, haircuts, ink, etc. ”” I think having your team look a bit more uniform is a refreshing change. • I’ve always loved basketball warm-ups because they’re a chance to get your team looking more and more consistent with all that extra material. Sleeves remind me of those sleeved warm-ups. I wouldn’t say I’m a big fan of the sleeved Jersey, but I think it’s an innovative step that I appreciate. And in many cases I don’t think they look bad. 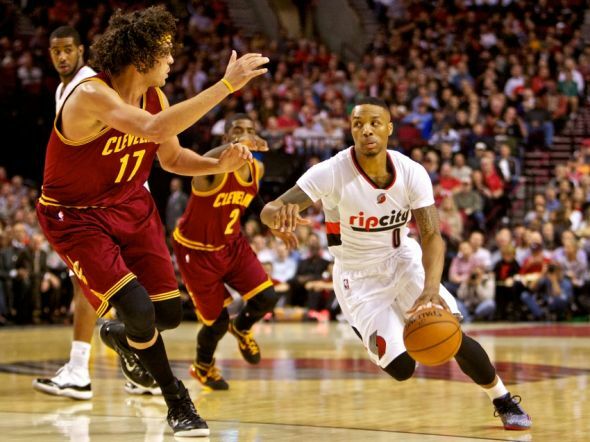 For instance, I prefer the sleeved uniforms of my favorite team, Portland. This is mainly due to the retro lettering reminiscent of the 80s teams, along with the side stripe design. I would not say the sleeves make it better, but it’s not bad. I remember when Evansville had sleeved jerseys back in the day, and I thought that was a bold move by the school. Similar to Oakland U and the old NBA Kings having the NOB under the numbers, instead of above. From an aesthetic standpoint, I love sleeved jerseys. I don’t find human shoulders to be aesthetically pleasing. That goes for both genders, and all ages. I don’t think sleeveless wedding dresses look good (anyone who might be able to “pull it off” would undoubtedly look even better in a sleeved option). I don’t think that sleeveless men’s shirts ever look good. I have two children — a boy and a girl. When my wife puts either of them in sleeveless clothing, I cringe. Every. Single. Time. I like the sleeved NBA jerseys simply because they challenge the conventional image of a basketball jersey. I do think they would look better with wordmarks rather than logos, and I do wish the sleeves were wider and unrestricting. Not sure I’d be considered a huge “fan” of the sleeves, but I don’t mind them as much as it seems others do. My guess is this comes from my growing up in the ’80s/’90s and I remember when a lot of college players wore T-shirts under their jerseys. I do like the idea of sleeved jerseys but I don’t like the way this is being managed by the NBA. I’ve seen a lot of people outside of the NBA play basketball with shirts underneath their tank tops. I’ve also seen this in the NCAA, although I think this is becoming less common as players tend to imitate the pros. When I used to play, I always wore sleeves and it made no difference in terms comfort while playing — just a personal decision due to my not having strong arms, so I preferred to cover them. I like the idea of having sleeved jerseys as an option, just like how soccer players can wear either short or long sleeves depending on their preferences. Another great example is Aussie football, where players may go either sleeveless or long-sleeved (but no short sleeve is available). The players still look in uniform, at least to me, because the sleeve size is the only thing changing. In other words, you don’t need to create a new sleeved jersey for the NBA — just make the regular jerseys in both sleeved and unsleeved versions and let the players choose which one they prefer to use. Unfortunately, most of the NBA sleeved designs I’ve seen just have a big logo. It’s lazy design and it bothers me. What’s the point of having a sleeve if you’re not going to put something on it? I like the sleeved NBA jerseys for two reasons: First, they provide a more modern and simplistic feel (especially the ones with no trim). Also, they seem more festive, because the jersey is wider and covers more of the player with color. I’ve never been a big NBA fan, so whether the jerseys have sleeves or not isn’t going to keep me up at night. But I do like the look, and I fully acknowledge that my reason for liking it is fairly absurd, but here it is: Given the choice, I’d prefer not to see somebody’s hairy armpits. It’s about as simple as that. I understand that sleeves are probably constricting for players, but I find the sleeved look more aesthetically pleasing. As for liking something that many other people dislike, I’m more used to being in the position of disliking something that everybody else seems to love (Rafael Nadal and Tiger Woods being prime examples from the world of sport). Knowing that I’m in the minority about jersey sleeves doesn’t trouble me too much because, like I said, I don’t spend too much time thinking about the NBA anyway. ”” Judy A.
I really adore the idea of sleeves, although there are caveats to that. A classic, clean design impresses me with sleeves just as much as great design on a traditional tank top. I do enjoy things that are different, and while I enjoy sleeved jerseys, I know that a league-wide proliferation would dampen my enthusiasm. I love that sleeved jerseys are not new to the sport — the pictures on your site showing sleeved jerseys from the ’40s, ’50s and ’60s make me like the trend even more. I see it as a bit of a throwback thing, as well as a new thing. As an amateur local league player, I’ve often played or trained in sleeves, so the NBA sleeves feels like a connection to the way I play, like I’m somehow playing the same game as the professionals (when of course the truth is that it is a completely different game). I think I will continue to enjoy the sleeves should they not become the norm. I would also like it if one team went fully sleeved. I like quirks — the Lakers only wearing yellow at home (that this has changed is annoying), the Cowboys’ home whites, the Yankees without names on back, Glasgow Celtic many years ago only had their numbers on their shorts, and so on. A team that went fully sleeved could fit into that group. I like the sleeved look because I am one of those people who like to see tradition change. First off, how do people not like these? A fan can actually wear a T-shirt and not look ridiculous. Tank tops are for early-’90s Marky Mark, Justin Bieber, and hot girls in underwear ads. Literally every body shape can wear a T-shirt and feel great. Even if you are a shredded bro, you still look better in anything other than a tank top. So, yes, I think Adidas was brilliant for creating these from a sales point of view. These jerseys take chances. They are different than the boring old standard NBA jersey. Charlotte became “Buzz City,” Houston became “Clutch City” (and before that, something written in Chinese), Portland became (on a jersey) “Rip City,” New Orleans became “NOLA” on a gorgeous purple jersey, the Wizards have a super-cool retro stripe down their chest connecting to their shorts. Those are all absolute beauties. Are all sleeved jerseys perfect? No, what league-wide jersey set is? Golden State wearing way too much yellow and pairing it with a different color yellow, pinstriped baggy MC Hammer shorts? When do they wear those? Laundry day? However, plenty of teams have nailed it. Other than those I just mentioned, honorable mention goes to the Clippers’ baby blues, the Nets’ gray with blue numbers, and any team that had the white nameplate under the back number like the Bulls. Count me as one who likes the sleeved jerseys as long as it’s a good design. I also like when they put a design element on the sleeves, like the 2013 Xmas Day sleeves with the numbers. I have no strong feelings that a basketball jersey has to be sleeveless. Maybe that’s because I always wore T-shirts when I played pickup basketball. I’ve bought a few jerseys in my life but had never bought an NBA jersey because I don’t like showing off my skinny arms. I finally bought a NBA jersey when they offered one with sleeves. 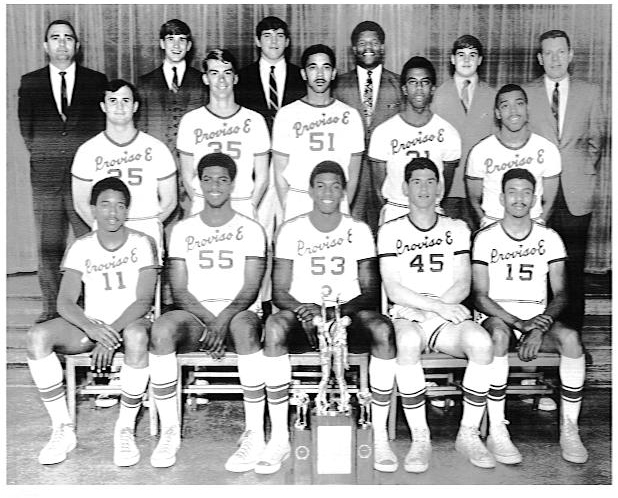 • I liked Golden State’s first sleeved set. • I hated the sleeved jerseys when it seemed like the NBA was shoving them down our throats. • Once I looked at the sleeved jerseys as individual uniforms instead of as a league-wide sales push, I realized there are ones that look nice and ones that look bad, just like with any other uniform. • I think that they look bad if worn too baggy. I’m pretty ambivalent on sleeved jerseys in terms of their aesthetics. At this point in basketball, the idea of sleeves on a jersey doesn’t look so out of place because the torsos/arms of various players are far from uniform. 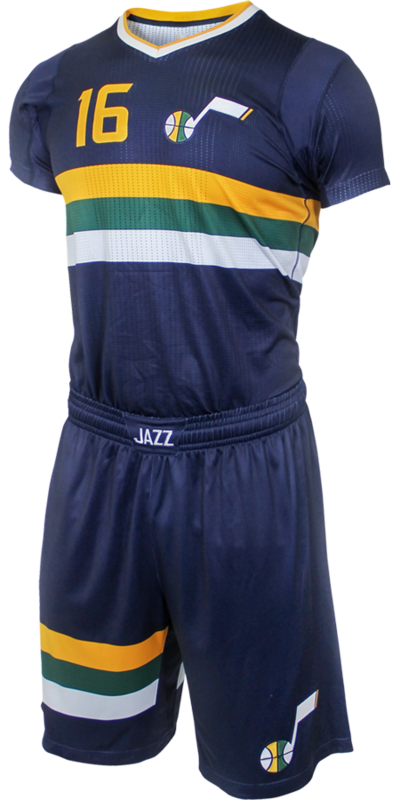 Shooting sleeves, short sleeve undershirts, even individual shoulder sleeves appear in various colors throughout the league (and to an extent in college). So on its face, the idea of a sleeved basketball jersey hardly seems blasphemous to me. But the manner in which the NBA and Adidas have deployed the idea is a real missed opportunity. I think I can see where the NBA is coming from in terms of merchandising. Soccer jerseys are incredibly popular and versatile as a “fashion” item. They can be paired as easily with jeans as with athletic shorts, and based on the look of the NBA designs, they are chasing this look. Of course, with the premium placed on “authentic” jerseys, they couldn’t simply produce these items to sell to fans without putting the look on the court. As I see it, there is a simple way for the NBA to have its cake and eat it too in this situation. Rather than have uniform sets in which every player wears the same jersey with sleeves, simply produce game jerseys in every design both with and without sleeves (much like the Warriors a few years ago with their home whites) and have players choose which sleeve length they prefer. This would be taking a page directly from soccer’s playbook, where both long and short sleeved jerseys can appear on the field at the same time with the same design. I am all for the sleeves. I think it’s a good change from the classic jersey look and brings a sense of modernism to the NBA. It helps bring attention to the jerseys, the NBA, and sales. But also, I appreciate them because I am a smaller person and as a kid I didn’t like wearing jerseys because I looked tiny as a point guard against stronger kids. So I went for the shirt-under-the-jersey look. Now that I see this with more teams, I love it.